Kind words make such a difference. They don't have to be flowery or full of beautiful prose, they simply need to be, well, kind. Their echoes truly are endless. Not only that, they spread. People who receive kindness are quicker to pass it on. 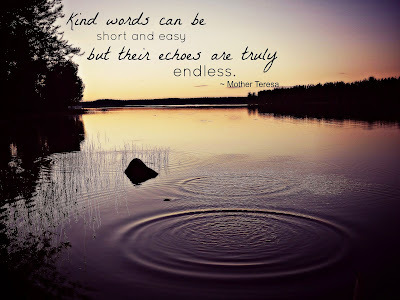 So who can you pass kind words on to today? Your blog is always an encouragement to me, Susan. Thank you. What a great quote. I'm pinning it to Pinterest. I know. This one stopped me. Even made me think of how I speak to my children. There's plenty of times I have to correct them, but am I also speaking words that will echo in their lives in a positive way? I strive for that balance, and this one reminded me of that.